1 What is MangoApps for Windows? 2 Where do I get the MangoApps for Windows app? 3 How do I login to MangoApps for Windows? 4 What are the MangoApps for Windows tabs? 5 How do I use MangoApps for Windows with Microsoft Outlook? 6 Why use links to files rather than file attachment in emails? 7 How can I configure the MangoApps for Windows preferences? 8 How do I use “Search” in MangoApps for Windows? 9 If I mark a notification as read, will it also be marked as read in other MangoApps clients? What is MangoApps for Windows? MangoApps for Windows is a desktop client with everything you need in MangoApps. With MangoApps for Windows, you can be notified of activity that you follow in MangoApps, have real-time chats with single colleagues or an entire team, and find and share files in MangoApps with colleagues. 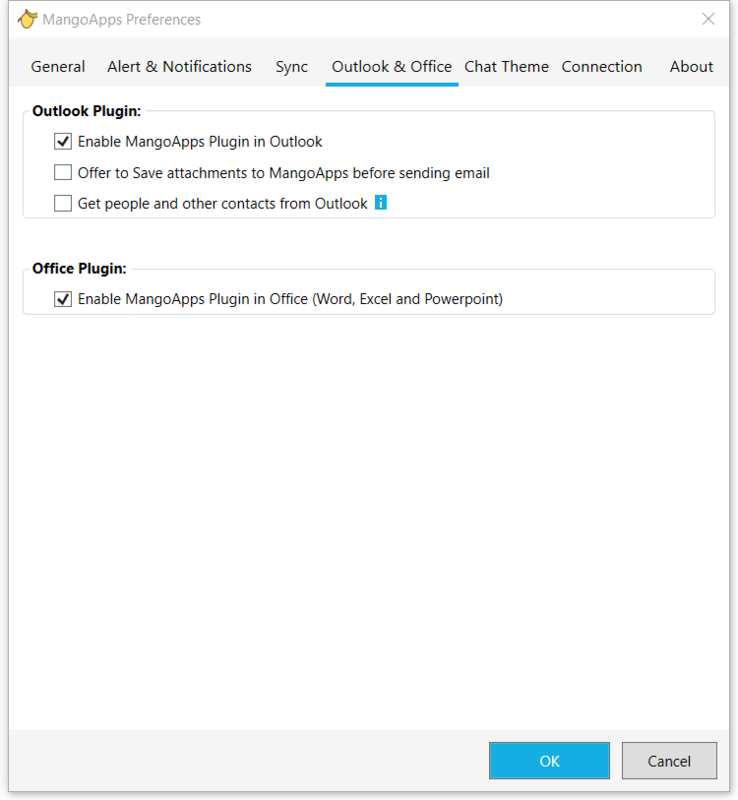 Additionally, MangoApps for Windows conveniently is available in Microsoft Outlook to allow you to attach MangoApps files or links to files to the emails that you send. You can be reminded about attachments that you’d like to upload to MangoApps and you can easily drag & drop files from emails directly onto the MangoApps Outlook sidebar. Where do I get the MangoApps for Windows app? 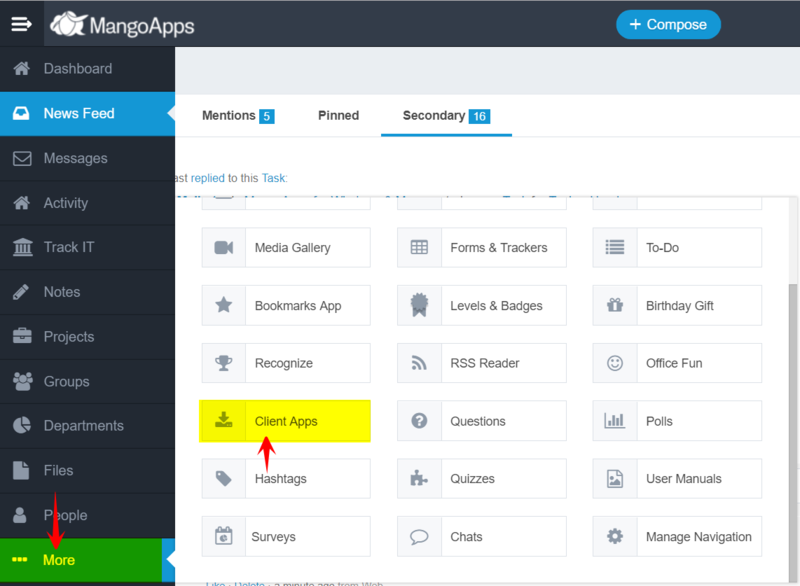 Download MangoApps for Windows from the “More > Client Apps” section of your MangoApps domain. Alternately you can download it directly from this page. How do I login to MangoApps for Windows? 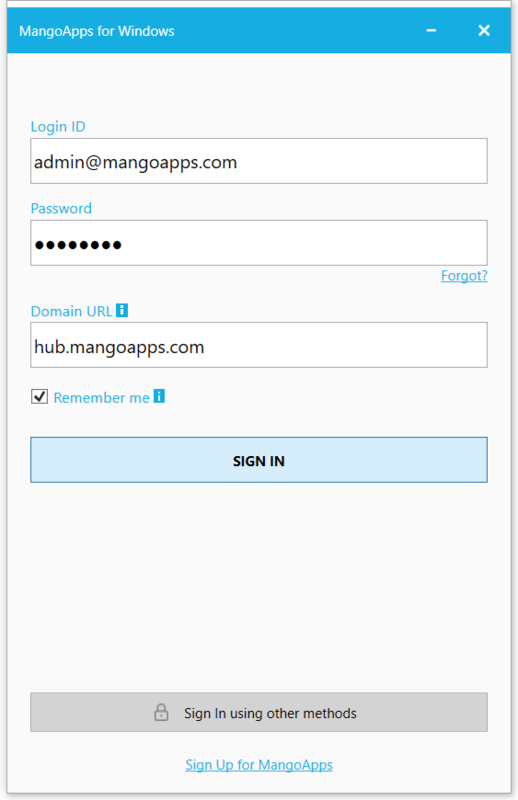 Login to MangoApps for Windows using your MangoApps Domain URL, user ID, and password. Your user ID is generally your email address. 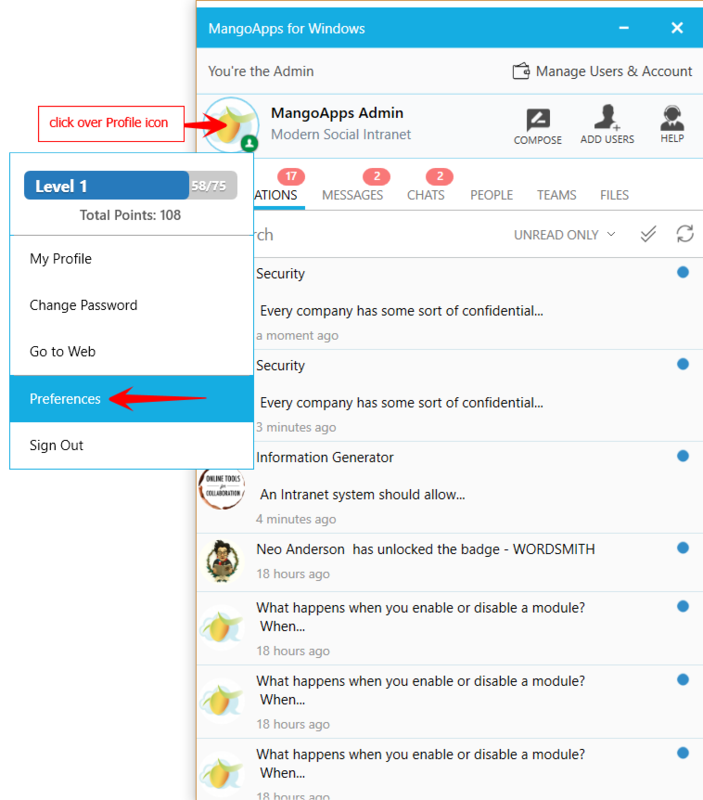 If you don’t remember your MangoApps Domain URL you can enter your email address by clicking the “Login” button on the top-right side of this page. Start by searching on the US server first then try the server that is closest to your geographic location next, and so on. What are the MangoApps for Windows tabs? This tab lists all your (read/unread) notifications. One place to access your Private messages. One place to access your all Chats (Private and Team). You can quickly find the person you need to chat with or communicate in from the “Colleagues” tab. You can quickly find the team you need to chat with or communicate in from the “Teams” tab. You can quickly view all your sync’ed files and folders. How do I use MangoApps for Windows with Microsoft Outlook? Installing MangoApps for Windows automatically registers the app to show a sidebar in Microsoft Outlook for Windows (2010 and 2013). In Microsoft Outlook, click on “Show Sidebar” if necessary to reveal MangoApps for Windows. Once your account is added and you have successfully signed in and turn on this “Offer to Save attachments to MangoApps before sending email.” Outlook setting, this will in turns ask you to save the documents whenever there is an Outgoing email with an attachments from Outlook. A short video showing the Outlook Plugin functionality. Why use links to files rather than file attachment in emails? Links require no additional overhead while sending emails so you don’t have to wait for attachments to be uploaded to the email server before sending. Plus, links allow you to share files that are well larger (up to 2 GB) than your email server attachment filesize limit. How can I configure the MangoApps for Windows preferences? Open the preferences window by clicking on the “Profile Picture > Preferences” option. The ability to turn on or off the Outlook sidebar plugin. 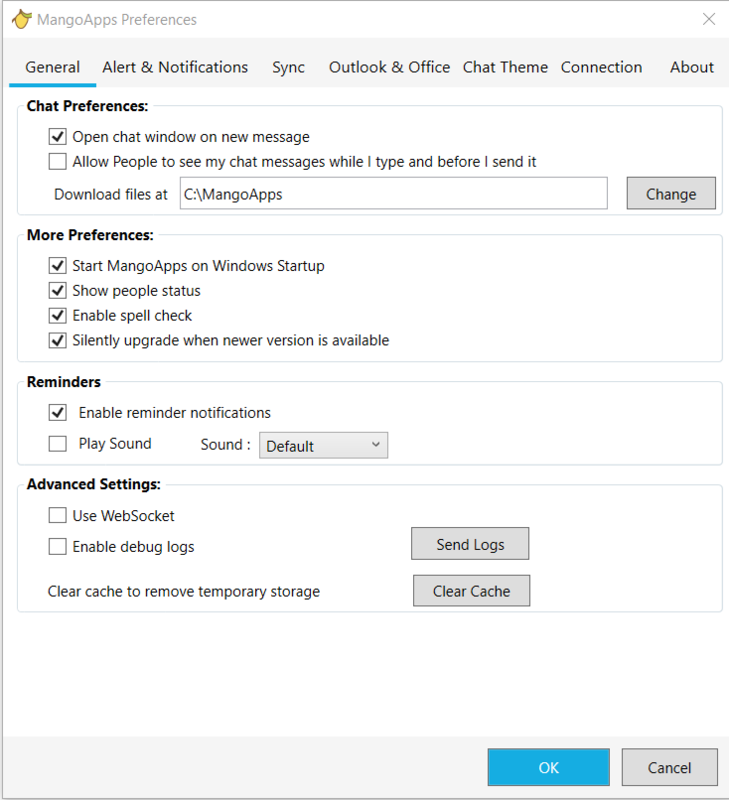 Enable or Disable the prompt in Outlook to upload attachments to MangoApps. 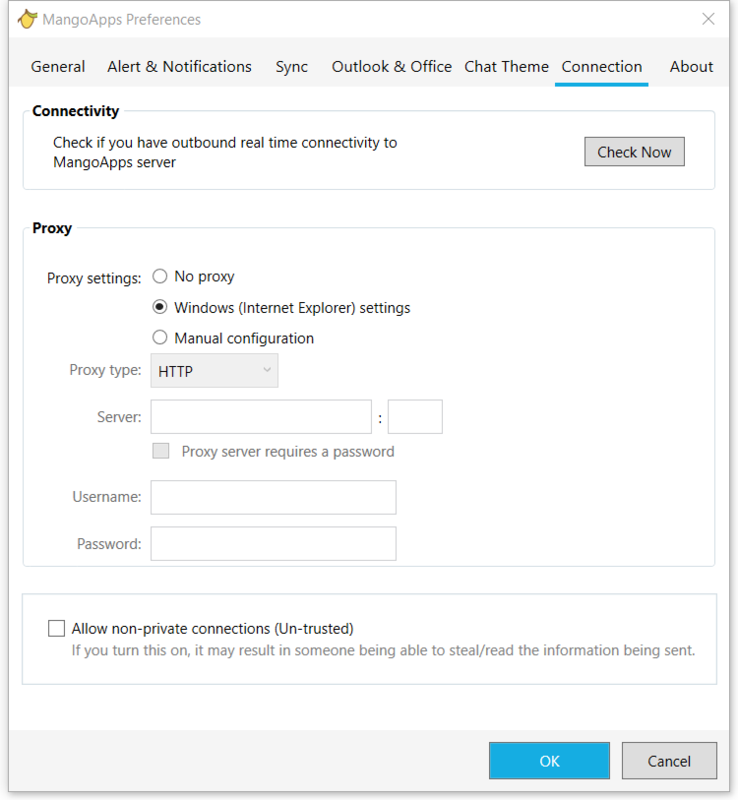 The tabs for Proxy and Advanced settings are available alongside the General and Outlook & Office settings. These settings are changed infrequently if at all by most users. Send us a question to support@mangoapps.com if there are questions about Proxy or Advanced settings. How do I use “Search” in MangoApps for Windows? 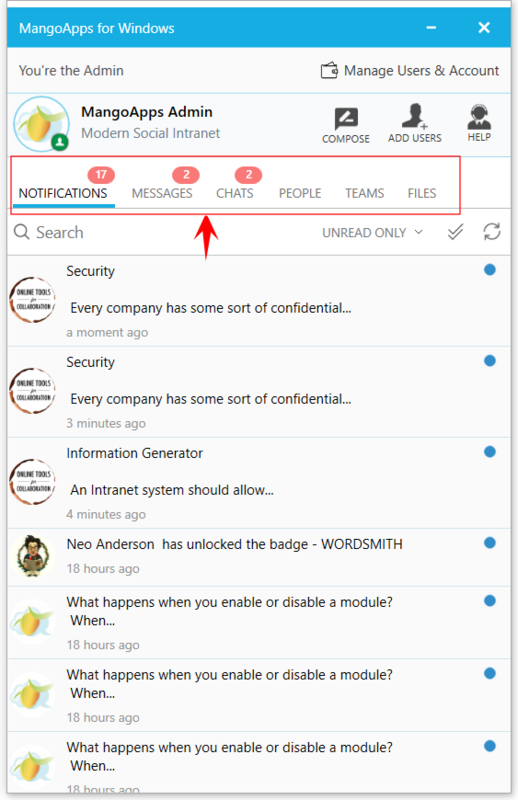 The “Search” feature allows you to search your notifications, messages, chats, teams and colleagues. Below video showing the search functionality in the MangoApps Windows application. If I mark a notification as read, will it also be marked as read in other MangoApps clients? Yes, marking a notification as read in MangoApps for Windows will automatically mark that notification read across Web and Mobile clients as well.